“I think you’d better wear your waterproof jacket” said my wife as I headed out of the door this evening. It was good advice. It had been a beautiful, warm day but there were ominous banks of black clouds piling up in the west. I hurried up to the wood as it grew darker and darker. The weather forecast was for thunderstorms, and so far it seemed to be accurate. I thought about the rhyme as I walked through a mixed wood of mature oak and ash trees on the top of the tallest hill in the area. I hoped it wasn’t true. I settled down at the east end of the sett from a spot where the outer holes are visible across a small ravine. The spot isn’t perfect – it’s not possible to see the holes in the undergrowth at the top of the small rise on which the sett lies, and it’s quite far away so you really need binoculars – but it’s the best place to get a view of this end of the sett. 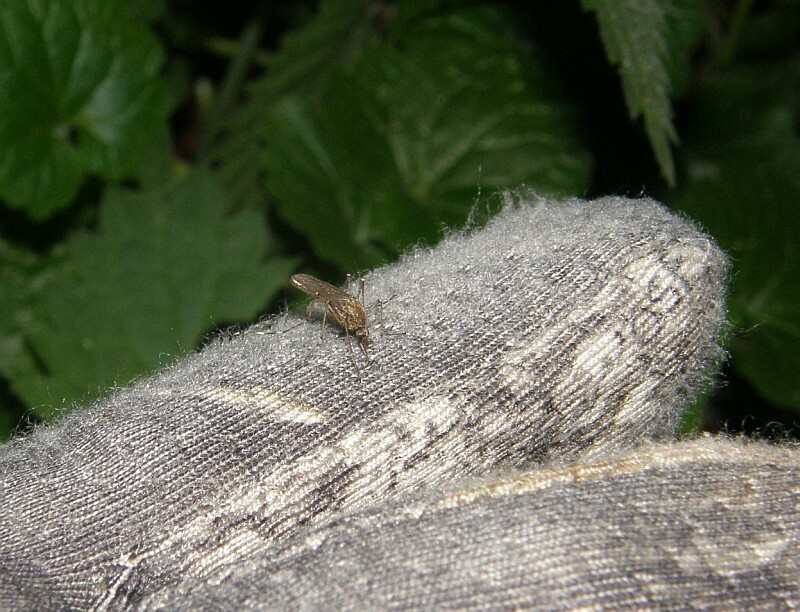 In a spirit of scientific recording (and having nothing else to do at the time) I photographed a mosquito biting me through my camouflage gloves. And then I squished it. At 8.16 a badger appeared from one of the visible holes. It trotted quickly to the large latrine site and then hurried back underground. By this time it was too dark for photographs. At 8.30 another badger came out of another hole and did the same thing. Ten minutes or so later, both badgers (or different ones) came out together. There was still no real social behaviour: the badgers seemed distracted or on edge somehow. *In British colonial times, officials in India and Africa were issued with canvas ‘mosquito boots’ for just this purpose. Perhaps I’ll see if they’re still made anywhere. Aye, Mosquitoes are the misery of the Watcher. I have tried all sorts of deterrants. Some Scottish Stalkers swear by ‘Skin so soft’, it may work on midges but not on the bigger biters. I had some Alaskan Super strength DEET, it was 80% or something and melted the rubber cups on my old Zeiss. It would make me dizzy when I put it on. I don’t like the chemical repellants, they smell extra funky, which you don’t want when close to Badgers even with a stiff onwards breeze. My friends in the States swear by Thermocell, a unit that has a heated wick that gives off repellant. But in England where winds are likely to be stiffer I have heard of more limited success. I bought a camo Mosquito top and pants [with built in head net] a few years back. Put it over cotton fatigues and got bitten to high hell on my legs. I put the thin lycra type Rynoskin underneath and it still didnt fend them off. It was obvious that British Mozzies were made of much sterner stuff than the yankee flys. Hereabouts I think someone has dumped steroids into a pond. Now I wear, shell pants under cotton pants, covered by the bug suit. A sweat shirt with bug jacket on top. Light ankle hikers, pants pulled over and two pairs of gloves. Its gets sweaty in late June I can tell you, especially when I cycle to Setts. One of these days i’ll invest in a Shannon Outdoors bug suit [Double laminate]. I thought I had it bad with mosquitoes, but it sounds like you have the real hard cases. Another attack of the Piranha Mosquitoes! Like you, I don’t like the idea of chemical repellents – there’s no point in going to a lot of trouble to minimise scent and then splashing on some powerful-smelling bug spray. It sounds like you should be proof against anything wearing all those clothes. Even if they don’t protect you from the mozzies, they should protect you against a tolerably determined sword thrust (to misquote Pratchett). I’ll have a look on the interweb for the Shannon suit in the meantime. Yes you got that right, you keep the Mosquitoes from spearing you but collapse from dehydration/heat stroke. RecentlyI took an ex Commando of the korean and malayan conflicts to watch a Sett. He was a bit hard of hearing and misheard my offer on a headnet. He had squandrons around his head and he never twitched. Training. I saw him the next day and he looked like he had leprosy! Its not so much the bite that ‘bugs’ you as the days of itching welts to follow. But it will take more than that discomfort to stop our watches hey. I know exactly what you mean Ghillie. Some years ago I lived in Kent, and I used to go carp fishing in a beautiful lake in Fordwich, near Canterbury. The mozzies there were the worst I’ve ever known. I used to sit there at night with my landing net over my hat to keep them off. One night as I sat there I counted 17 of the horrors sitting on the net directly in front of my face. Eventually the inevitable happened. I fell asleep and the net must have fallen back onto my face. I woke up looking like the Elephant Man, with one side of my face a mass of bites that all blended into each other. Mind you, it really was a beautiful lake. I fished there for an entire summer and never even got a twitch off a carp. But I don’t regret a minute of it.